Clifftop residents are desperate for sea defence scheme to be implemented to end their nightmare. They await their fate like the inmates of Death Row. Each day, each storm, moves their homes a little closer to the cliff edge of oblivion. Yet the people are innocent. Their only “crime” is to have bought a home close to the seaside, like generations before them, to enjoy the bracing air, spectacular sea views, and walks along the nearby beach. But they are currently sentenced to a life of worry, anger and frustration as that beach inches ominously closer, through a combination of action by Mother Nature and inaction by Government bureaucrats. The real guilty parties, according to local campaigners, are the Whitehall paper-shufflers who do not understand the urgency of the situation at Happisburgh. The village has been battling for years to replace the worn-out wood revetments built in the 1950s in a frenzy of post 1953 flood defence construction. But its east end has been going west at an increasing rate of knots. Soft sandy cliffs have been tumbling into the sea. A bay has appeared. And, most dramatically, a string of holiday chalets have disappeared – either over the edge, or pulled down as doom and danger knocked on their doors. The district council has drawn up a series of sea defence schemes but has constantly struggled against two major obstacles – Government red tape and local objectors. Government rules have made it difficult to come up with projects which meet a “cost-benefit” formula, which demands that schemes should not cost more than the land and property they are designed to protect. The string of low value holiday chalets in the main firing line did not help boost the sums, but officials have played what they thought was an environmental ace up their sleeve, saying there was also a danger of the sea breaching into the priceless Norfolk Broads within 20 years. But the feedback from Government was that it was too early to play that trump card. Ministers have visited the site, but – and it is a fact that says it all – the land they walked along is no longer there. It too has been swallowed by the sea. Three successive MPs have called for action, and a local campaign group was set up to force a speedy conclusion to the latest stalemate, which has seen a £700,000 scheme of rock protection and groyne repairs – much cheaper than earlier multi-million pound solutions – stuck in the sea defence sausage machine for months. Part of the problem is objections from two “regulars” who have lodged official opposition to the past three schemes. Professor Keith Clayton, a retired environmentalist from the University of East Anglia, continues to float his academic view that the best form of coast protection is to let nature take its course rather than to have any man-made interventions. He says a patch-and-mend mentality is no good, but that the North Norfolk coast needs to be managed as a whole. And he adds that the solution is now out of his hands and with the Department for Environment, Food and Rural Affairs. He also believes that people losing their homes should be compensated. Local lord of the manor Eric Couzens is objecting on several points, including navigation concerns for the lifeboat, safety worries about people being trapped on the beach by the groyne and disappointment that the scheme does not deal with the danger of flooding the low-lying land behind the cliffs. He refuses to speak to the media. But the groundswell of local opinion is that these issues should be dismissed by Defra, in favour of getting the scheme started urgently, to save more homes from being lost. 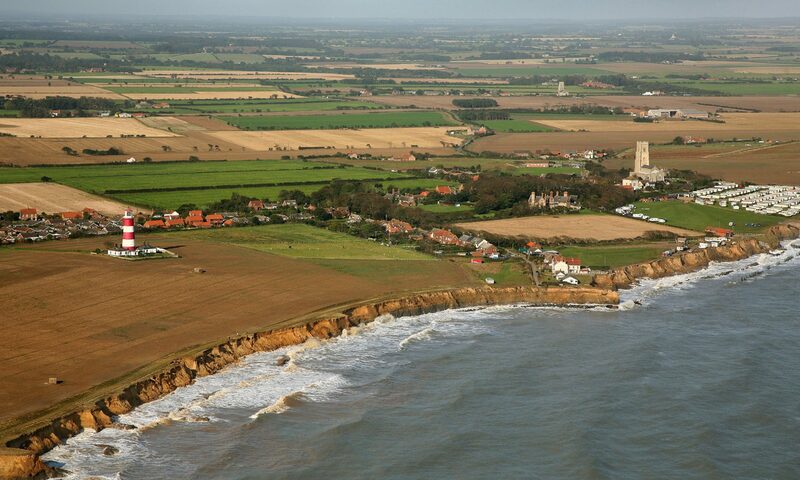 While Happisburgh awaits a Defra hearing, the fears are that it will take weeks, and even if there is a favourable decision it might not come until after Christmas – by which time the cliff edge could be slicing across the back gardens of some of the brick-built homes in Beach Road for the first time. Previous victims have all been wooden chalets and caravans, but the danger is now creeping closer to the more permanent homes in that part of the village. Officials say that, if the scheme got the go-ahead, a start could be made in a fortnight. Council officials are visiting the area virtually daily to talk to residents, update them on developments, check the cliffs and even discuss possible evacuation measures. Local district councillor Sue Willis said that emotions were running high among the people affected by the erosion risk. She commented: “They are worried sick. There is anger and frustration. The officers have done everything in their power to get a scheme off the ground, as well as being sensitive and kind to the local residents. But these people at Defra sit in their ivory tower and have no idea at what is happening out here.” Hinting at the situation at Salthouse and Cley, where a new clay bank is soon to be rebuilt, helped by the area’s ranking as an international wildlife reserve, she added: “If this was a rare bird we were trying to protect, new defences would have been paid for by now. But what about people?” She urged the objectors to “see sense” and withdraw their objections. The situation was all the more poignant in the lead up to Christmas, she said. “There are people there with families who are trying to plan for Christmas, but do not know what the future holds.” Mrs Willis said it was no longer and good “being nice” to a department that was doing nothing, apart from chasing paperwork. She welcomed any moves to get action from Defra, and help for Happisburgh. Defra said that it wrote to North Norfolk District Council on October 8, “telling them what they had to do next. The council is responsible for taking the scheme forward,” said a spokeswoman, who went on to say that Defra would be called upon to adjudicate “only when we have received the relevant documentation from the council.” This would include planning permission and local land owner permission. North Norfolk MP Norman Lamb said at the weekend: “Let’s get on with the hearing now, we have to get a decision on this. I am a layman on the sea defence issue and I am conscious that there are differing views about the effectiveness of the scheme. But I am absolutely convinced that there is no cause for delay in having a hearing, where the experts can reach a decision. If the experts then see it as a runner, then for goodness sake get on with it.” Mr Lamb has raised the question of the Hold-ups with Defra minister Elloit Morley. Local action group co-ordinator Malcolm Kerby said concern was reaching fever pitch. “We understand everybody has a right to object. But it is important that they exercise that right responsibly,” he said. “We feel these two men are being irresponsible, and that Defra has the discretion to overrule them.” Mr Kerby said a public consultation over the scheme had resulted in 325 supporters. Ironically, the people in danger at Happisburgh can look eastwards along the coast and see millions of pounds worth of man-made reefs off Sea Palling – which rubs salt into their already-sore wounds. Happisburgh’s line of wooden revetments were built to protect the shore in front of the village in a wave of coastal defences put up in the aftermath of the 1953 floods. A £2 million scheme is drawn up to provide a line of rock replacing the worn-out wooden defences. It drew objections from two men, Prof Keith Clayton and lord of the manor Eric Couzens. Other objections from Norfolk County Council, which raised concerns about building a “Maginot line” to protect “tatty” chalets, were later withdrawn. But the scheme foundered after failing to meet ministry funding criteria. A new shoreline management plan for the area comes up with a policy of “hold the line” at Happisburgh as opposed to the “managed retreat” earmarked for other stretches of coast. A report by consultants Halcrow looked into how a scheme could link in strategically with the new man-made reefs at Sea Palling. It proposed a £2.7 million scheme of reefs built on the beaches. There were objections from Messrs Clayton and Couzens. But the scheme could not proceed because of new Government “cost benefit” rules, which mean defences cannot cost more than the land and property they are trying to protect. March – The impact of the failing defences hits the headlines as the clifftop home of George and Jeanne Scott teeters on, and finally topples, over the edge, following an 11th hour evacuation by the couple. May – Visiting junior agriculture minister Tim Boswell is handed a dossier of stories from the News’ sister paper, the Eastern Daily Press, called On The Doorstep of Disaster, to help him understand the urgency of the Happisburgh problem. He said “I haven’t brought my chequebook today” and later called for more cost-effective scheme than the £4.6 million one on the drawing board. November – A new £3.7 million project of rock breakwaters is hatched instead. Prof Clayton objected and stressed he did not feel guilty. He said: “I do not make a habit of objecting to these schemes. I have only done it three times and do not do it for amusement.” He felt the money spent on sea defences to protect “wooden houses” could be spent on housing, hospitals and schools. January – Despite the parlous state of the cliffs a little blue three-bedroomed wooded bungalow in Beach Road, called Kenrick, attracts more than 20 potential buyers, even though it only had a limited lifespan. Three sales fell before it eventually sold to an Essex woman, for much less than the £17,000 top bid in a sealed auction in January. March – A Coastal Concern Action Group is set up after a public meeting at which Pat Gowen, of the North Sea Action Group, blamed offshore dredging for the bigger waves which were speeding up erosion. The latest scheme for a smaller, more affordable £700,000 scheme is drawn up. It features a rock groyne, rock revetment and repairs to an existing groyne. The council says it could be Happisburgh’s “last chance”, with Government moves to switch more funding to inland flooding problems. There were objections from Messers Clayton and Couzens. From January to May this year council officials tried to resolve the objections, without success, meaning that the scheme must now await a hearing from Defra to decide its fate. As the red tape surrounding the proposed sea-defence scheme at Happisburgh prevents work from starting, Edward Foss met some of the people closest to the edge. They speak with a common voice, an anger and desperation borne of frustration and endless waiting. Erica and Malcolm Barber have 38ft of land left between their garage and the cliff. If they are still in their home this Christmas, they will have lived there for 11 years. The Barbers still have four years to pay on their mortgage, a commitment they say they will stick to even if their home is lost to the sea. “Touch wood, none of the cliff has gone in the last few days but we are still in the lap of the gods at the moment,” said Mrs Barber. And Mr Barber added: “It seems to me that there are people who are trying to slow it down and slow it down.” The couple said compensation would help, but more than anything wanted protection for their home. The Beebys say they realise they could be within an immediately dangerous distance of the cliff by February. “We are hopeful we will be here this time next year but we have to be realistic. I would just like to pick up my bungalow and move it,” said Mrs Beeby.